Digimon World 3 is the third game in a series of RPGs for the Playstation, known collectively as the Digimon World series. 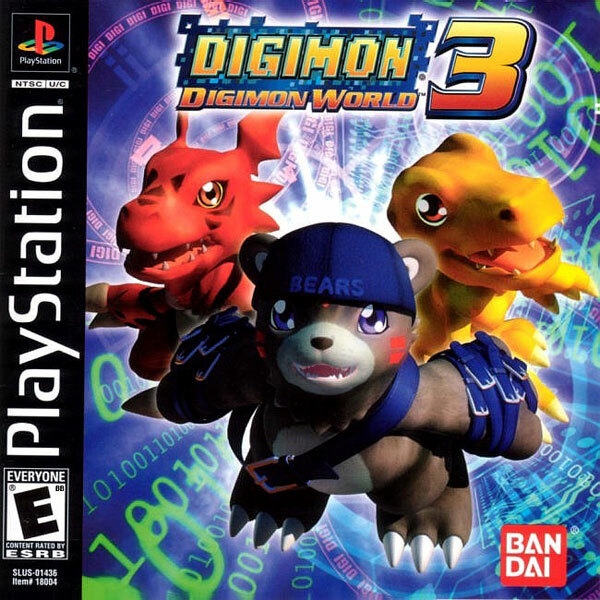 Have you played Digimon World 1, where it's basically a breeding game with light RPG elements, or Digimon World 2, where it's a dungeon crawler with three-on-three turn-based combat? Well congratulations, this game is nothing like those two. It was released as Digimon World 3 in Japan and the US, and Digimon World 2003 in PAL regions (likely because they never got Digimon World 2). I know what the differences are between the two versions, and I'll be showing those off to the best of my abilities, don't worry. Digimon World 3 itself is an RPG with random encounters and one-on-one turn-based combat. You play as Junior, some kid that really likes Digimon. We enter an online virtual reality MMORPG called "Digimon Online" and play around for a little bit. Certainly, nothing can go wrong here. It's a completely different style than the first two games (Digimon World 1 being more focused on the breeding, and Digimon World 2 being a completely different genre) but that's okay. The Digimon series as a whole is basically a Pokemon knock-off, but don't think too hard about it. This game in particular is pretty close to those games, if a little simpler in terms of tactical rock-paper-scissors and a little more grind-heavy. Unfortunately, Digimon World 3 didn't do so well commercially, probably because of aforementioned grind-heavy gameplay. General reviews are 4/10. While it definitely has its flaws (Cardmon! Argh! ) I grew up playing this game and I have a soft spot for it. I've never managed to finish it, but maybe now I have the incentive to do so. So, do I need to watch the show to understand what's going on? Nope! Don't worry about it in the slightest. I'll be making observations here and there if references pop up, but by and large you should be fine without any prior knowledge of Digimon. None, please. This is a jRPG and as we all know that means it's going to take a left turn into crazy town before we go kill God or something. I know for a fact that I haven't gotten to the crazy parts of the game yet (since I think last time I stopped playing somewhere around the second town?) and I'd like to be surprised at the insanity that comes up. Basically, if we've seen it in the LP, it's fair game; if I've made a point of mentioning that I'll talk about it later, don't go crazy but it's not under the spoiler policy. Other than that, no spoilers please. Who's the staff for this LP? Joking aside, giver336 is going to be joining me as co-commentator for this ride. He'll be speaking in bold text. Basically, how it works is this. If it's plain text, it's my commentary. Italics without a name attached is a brief summary of things that I'm skipping past. Name: If it's got a name in front of italics, that's dialogue. Giver is gonna be talking in bold. Alright, good to go, everyone? Then let's jack in!